Still undecided about how you'll spend Canada's 151st birthday? Communities across B.C. 's Lower Mainland are planning to celebrate with everything from morning parades to evening fireworks. 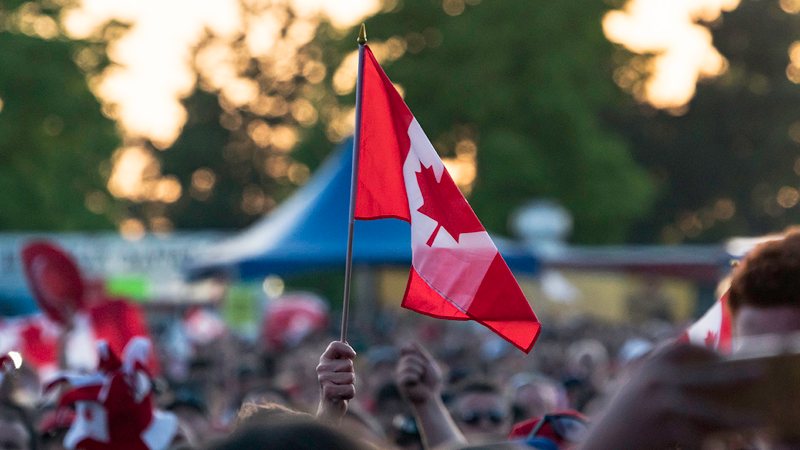 CTV Vancouver will be broadcasting live from one of the largest parties – Surrey Canada Day – but we've rounded up a list of July 1 events happening from Whistler to Hope. Scroll down or click here to view the events on an interactive map. Want to spend the day downtown? 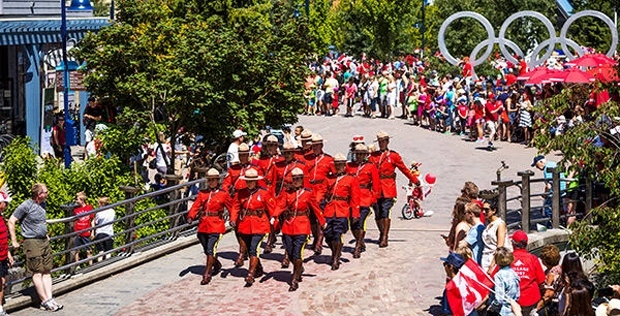 The celebrations at Canada Place begin with a 10 a.m. citizenship ceremony, and continue through the day with musical performances, exhibits and food trucks. The grand finale, a 20-minute fireworks show, starts at 10:30 p.m. The best viewing locations include Canada Place, Harbour Green Park, Coal Harbour, Stanley Park near the 9 o'clock gun, Crab Park and the West Vancouver seawall between Ambleside and Dundarave. A full schedule, including performer bios, is available on the Canada Place website. The event put on by the Port of Vancouver is billed as the largest Canada Day celebration outside of Ottawa. Looking for something less crowded? Show your Canadian pride with music, games, arts and crafts and more at the Renfrew Park Community Centre. The event is hosted by students from Windermere High School, and will be held between noon and 4 p.m. The Sunset Community Association is offering up another family-friendly option at Sunset Park, featuring free carnival rides, barbecue and concessions and live entertainment. 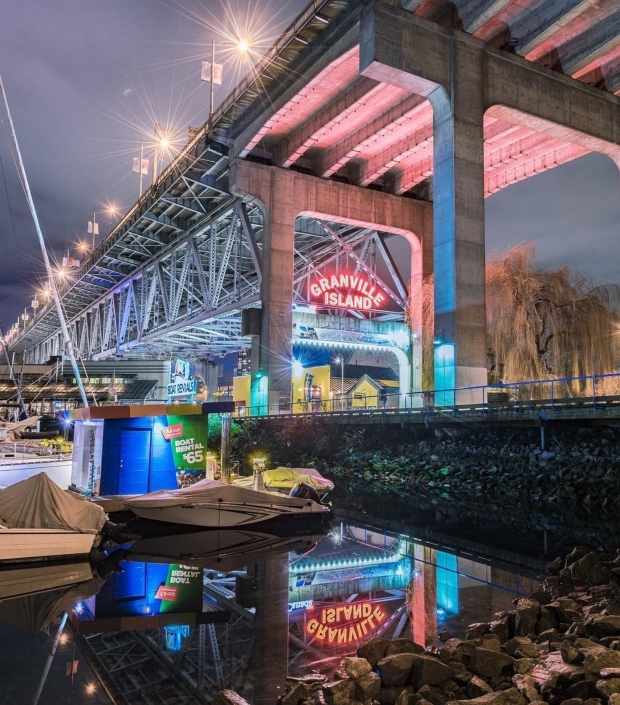 The businesses on Granville Island are hosting events all day, including performances by Indigenous artists, a market of crafts and food, a lobster cookout, carnival games and drop-in workshops. Create your own T-shirts, buttons and puppets, try your hand at dying wool, listen to jazz, check out a free dog show or have your face painted. Other kid-friendly options include a splash pad, traditional parade, decorated bike parade, African music and dance show and roving buskers and other performers. If you'd rather do something more active, the Summer Warm Up festival is planned for 10 a.m. to 4 p.m. outside the Vancouver Art Gallery. Presented by Sport BC and the City of Vancouver, the all-ages event will let attendees check out a variety of sports and activities. Another option to get physical is the annual Canada Day race through Pacific Spirit Park. Runners will sing the anthem before heading to the starting line for a kids' run, 5K and 10K. Join the (full-day) party in Steveston, a celebration that includes several stages, tall ships, food trucks, a marketplace, a fire show and more. Events and exhibits will be set up in the Gulf of Georgia Cannery, Britannia Shipyards, Steveston Museum and hockey zone, as well as the historic village. The event takes place during the Steveston Salmon Festival, so hungry visitors can pick up a grilled filet before checking out the performances and midway. Richmond Canada Day culminates with fireworks starting at 10:15 p.m.
For some old-fashioned fun with a few modern twists, families can head to Kirkland House for an afternoon of free activities. Offerings include a performance by the Delta Police Pipe Band, a family picnic, rides and games, a display of antique vehicles, live music and food. The annual celebration at Diefenbaker Park takes place between 10 a.m. and 1 p.m., and includes food, drinks, live entertainment and face painting. Looking for fireworks? Head to Chalmers Park in North Delta after 5:30 p.m. Before the show, there will be children's activities, sports and games, food vendors, live music and an official ceremony. If you're up in the Whistler-Blackcomb area for the weekend, festivities include a parade through the village, a ceremony in Olympic Plaza, and a free concert from the Vancouver Symphony Orchestra. Further south, several activities are planned in West Vancouver's John Lawson Park. The festivities start at 4:30 p.m. with a kids' zone, live music and official ceremony. The fireworks, which are lit from two barges floating near Canada Place and the Dundarave-Ambleside area, begin at 10:30 p.m. They can be seen from John Lawson, but the best views are at Ambleside Park and Dundarave Park. Also in West Van, an artisan farmers' market will be set up at Ambleside Park from 10 a.m. to 3 p.m., featuring foods, jewelry, clothing, soap and more. Families looking for community-driven events can spend the day at Caulfield Elementary School, where bouncy castles, games, races, face painting and music are planned. Want to spend the day uphill? Wear your best red and white as you head up Grouse Mountain for activities including yoga, a pop-up shop, outdoor concert and barbecue. In addition to special events at the Mountaintop Plaza, there are also guided walks, a lumberjack show, movies in the theatre, demonstrations with live animals, a zipline and other activities. Staff will also be serving up Canadian cuisine including BeaverTails, poutine and beer. Head to Waterfront Park from noon to 4 p.m. in North Van for a day of free activities hosted by the Rotary Club of Lions Gate. The 30th annual event includes local performers, community displays, multicultural foods, free cupcakes, balloon artists and a fire juggler. 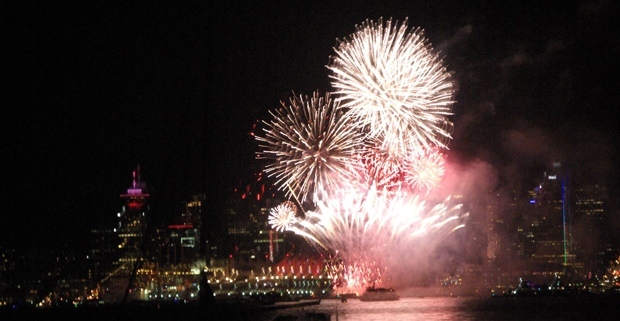 Fireworks set off between the North Shore and Canada Place start at 10:30 p.m.
Back on the other side of the Burrard Inlet, check out Said the Whale, DJ Khanvict and The Boom Booms at a free, family-friendly party at Swangard Stadium. In addition to live music, the event that starts at 5 p.m. includes games and activities, face painting, exhibits, prize draws and fireworks at dusk. Pets are not permitted. Earlier in the day, the Burnaby Village Museum will host a parade, multicultural entertainment, displays and demonstrations, kids' games and more. Edmonds Plaza and Park is also offering performances, face painting and kids' activities, in addition to swimming and a youth soccer tournament. Head to the Queen's Park bandshell for a day of family fun in New West. This year's event includes crafts, games, snacks, entertainment, a splash park and a petting zoo. Check out the city's Multicultural Festival at Westminster Pier Park from 3 p.m. to 10 p.m. for performers and artists from a variety of local ethnic communities. The festival also includes booths showcasing food and local businesses. 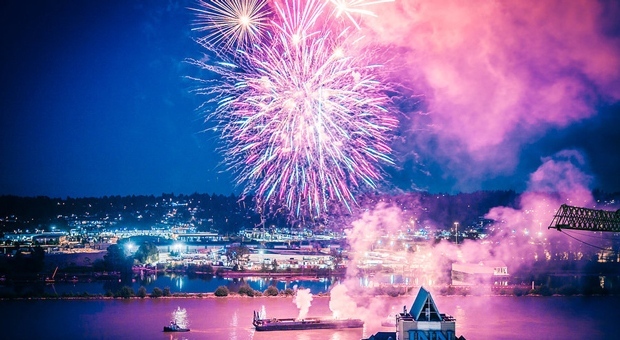 The event ends with dancing and fireworks, which are also visible from the New Westminster Quay starting at around 10 p.m.
Before the fireworks, visitors to the quay can check out restaurants and vendors at the River Market. There will also be roving performers and face paining, and live music on stage from 1 p.m. to 11. Celebrate Canada Day in Port Moody with a ceremony and more at Rocky Point Park. The park will feature live music, caricature artists, a giant inflatable slide and variety of food vendors. Canada Day is part of Golden Spike Days, and activities will be held at the park through the long weekend. In Coquitlam on July 1? The city is hosting a free festival at Town Centre Park which will include live entertainment, ethnic and regional food and multicultural activities. Fireworks will be set off over Lafarge Lake starting at 10 p.m. The celebrations start early in PoCo with an 8 a.m. pancake breakfast served in Lions Park by the local Lions Club, and a free fishing derby with prizes for kids under 10. Next, head over to Castle Park for an opening ceremony, national anthem, flag raising and cake at noon. The afternoon will include children's activities, performances by local artists, a marketplace and several food options, followed by a salmon barbecue put on by local firefighters. The evening will feature live music by B.C. performers, followed by fireworks starting at dusk. Stop by and say hi to CTV's Krissy Vann if you're at the Bill Reid Millennium Amphitheatre in Surrey Sunday. The party starts at 10 a.m. and ends at 11 p.m. Performers include Serena Ryder, Brett Kissel, local artists and bands and a First Nations dance group. There will also be a "musical adventure" for children ages three to nine. In addition to live music and dance, activities include rides, drone racing, food trucks, booths, giveaways, a tea party, sports and a youth skate park. Fireworks will be set off at 10:30 p.m. If you'd rather spend the day by the water, you can celebrate Canada Day at White Rock Beach. This year's event offers family-friendly activities all day, including a clown, face painting, photo booth, food trucks and live performances. Vendors will be set up along the promenade, and firefighters will put on a charity barbecue during the day. 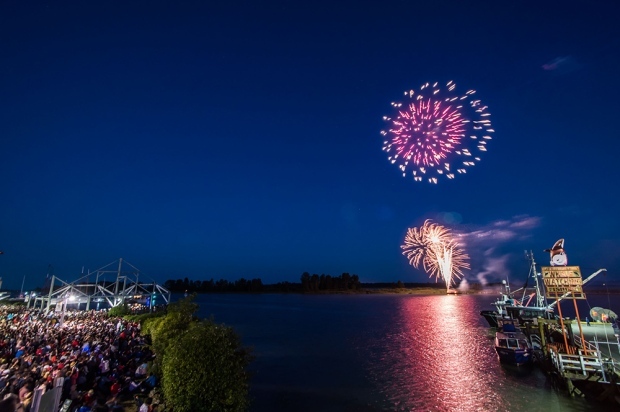 End the night with fireworks scheduled to start at 10:15 p.m.
From poutine to pony rides, and magic to music, Canada Day at the Fraser River Heritage Park boasts something for everything. The event opens with a pancake breakfast at 8 a.m. and will provide free fun until 5. 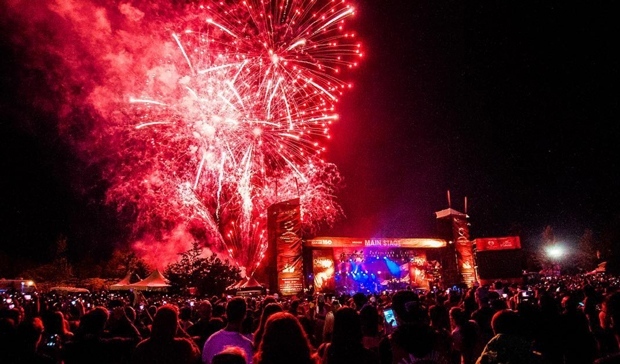 Fireworks will be lit off from the Mission Raceway starting at 10 p.m.
Canada Day in the Township of Langley means a day of free activities at Willoughby Community Park. Take in live performances, splash around in the spray park, and buy snacks from food trucks and a mini farmers' market. In the Kids' Zone, children can have their faces painted, try their hand at arts and crafts, challenge friends to a game of mini golf, take a ride on a trackless train, and play games and hop on inflatables. At the Langley Centennial Museum, kids can do crafts and play old-fashioned games. There will be a birthday cake, live performances and other activities. Celebrating in Pitt Meadows? Head to Spirit Square for activities from 8 a.m. to 2 p.m. The event includes a dog show, watermelon eating competition, performances, arts and crafts and pony rides. Also featured are a photo booth, kids' entertainment, exhibitions, an outdoor café, kite aerialist and food vendors. Visit Memorial Peace Park to take in a parade led by the colour guard, a formal ceremony and multiple stages for arts, culture, music and dance. Start your day with a parade hosted by the Mt. Lehman Community Association starting at 9:30 a.m.
Another parade starts at 11 a.m., and marches down South Fraser Way from Ware Street to Trethewey Street, heads along Trethewey and ends at Maclure Road. The parade features floats, emergency vehicles, old-fashioned cars and street performers. Head to Abbotsford Exhibition Park for performances on the main stage starting at 1:40 p.m., as well as community displays, play zones, mini golf, hay rides, pony rides, a food truck festival and artisan market. Stay for the fireworks starting at 10 p.m.
Another option in the city is at Highstreet Shopping Centre, where there will be live music, a pizza patio, beanbag toss and outdoor games. Start July 1 in Chilliwack with a $5 pancake breakfast at Evergreen Hall. The party in Townsend Park continues with children's entertainment, activities and food during the day, then live bands starting at 5 p.m. There will also be community group displays, bouncy castles, a vendor market and food trucks. New this year are a "Moms Lounge," beer garden and axe throwing. Fireworks will be set off at dusk. Love parades? Harrison Hot Springs' Canada Day festivities include a pet parade, main parade and light parade during the day. There will also be an official ceremony, kids' activities, entertainment and fireworks that start at 10 p.m.
Go to Centennial Park for free family fun from 9 a.m. to 2 p.m., including a pancake breakfast, craft market, bike decorating, welcoming ceremony, cake, live music and children's activities. Head to the Lightning Lake Day Use Area of the Manning Park Resort for a day of barbecuing, kids' crafts, face painting, Canadian music, community partners and historical entertainers. The Legion Hall is hosting a multicultural fair at the same time, featuring international foods, hands-on crafts and more. You can also celebrate at the Kilby Historic Site with a barbecue, old-fashioned ice cream demonstration, crafts, live music and other activities. Admission is by donation. Click through this interactive map to view celebrations planned in areas near you. If you're looking only for events with fireworks, click the legend symbol at the top, then uncheck "All July 1 events."